This area of nature has really been hot and humid as of the past few weeks. With highs in the high 90's f and heat indexes over 100. Only scattered occasional showers. The Canadian Geese have really been doing their thing and I have not seen so many families of so many little ones. This especially along Pleasant View road on the way to the Disc Golf Course. Also several have been killed on the road. The water pools at Bona Dea are holding up pretty well in the heat. They should with all the flooding there just recently as shown in previous posts. There have been several Baltimore Oriole birds at both places. The males being especially pretty. Have not taken photos of any yet but hope to later on before they leave out. I was following a guy at Bona Dea close to the parking lot when I noticed him beating something in the grass. I ran up there and it was a King Snake. I got him to stop but it was too late. This is a wildlife sanctuary and people are not allowed to kill or catch anything wildlife there. He did not know a king snake from any other snake but they have their place on earth too. People also pick the flowers when they are at their peak. On 06-03-11 I saw a real pretty Wild Sweet Potato Vine. This is actually and type of Morning Glory flower. They do make tubers also. That is the root part you can eat. This is the white flower with a burgundy center. This was very close to the gazebo by the main parking lot. The other photos here were taken at various times at the Disc Golf Course which is very close to Bona Dea. This is very strange but even though the photos were taken on different days, they were all taken right beside the small iron bridge by the parking lot. Just shows you what can happen when you have the patience to just stay put and let things come to you. 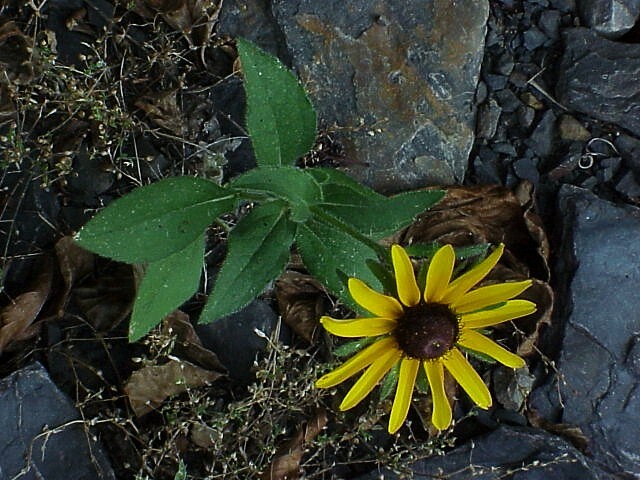 I can say this easily as I have a bad foot and do not go as far as I used to.Put at the north end of the bridge was this good specimen of a Black-eyed Susan- Rudbeckia hirta-wildflower. 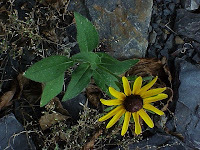 It is the pic of the yellow flower. Then on the south end of the bridge right next to it was this Common Spreadwing damselfly- Lestes disjunctus. This is a small dragonfly. It is the pic showing small splotches of blue on head and tail areas resting on the rock. In this same area around the bridge were 2 Prairie Racerunner-males- (Aspidoscelis sexlineata viridis). These are a type of lizard. These 2 were running around chasing each other and grabbing at each other. They were so excited that they were this beautiful and bright green and blue. They don't show this brightly when in normal temperament. .They have long tails and move very fast when they want to. Their tails come off on purpose when something grabs them. But the other day, I really saw something interesting. I have seen this action before many times but have not taken photos of this occurrence and really did not know what all was going on until I researched it. But literally at my feet was this wasp that was trying to carry this big worm/caterpillar around. I knew that it had killed it or was going to but did not know what it was going to do with it. Soooooooooo, I just kept watching. Then I saw it. It was taking it to a hole in the ground not far from my feet and the bridge. I then managed to scare the wasp away and took and hid the worm until I could run to get my camera out of the vehicle. I was hoping that it would stay around until I got back. I got the worm and put it back where I got it and sure nuff the wasp came back and started to carry it to the hole. I took several photos and these are some of them. One showing it with its jaws around the caterpillar and others showing it putting the worm in the hole and another showing it backing up to the hole and actually kicking small loose debris into the hole to fill it up. Also showing it carrying debris in its jaws and depositing it into the hole and finally showing the hole totally filled up. The wasp then padded the debris down pretty hard so you could not even tell a hole had been there. Research shows that this process is when this Thread-waisted Wasp - Ammophila procera, finds a caterpillar it carries it to its nest in the ground where it has already laid its eggs. Then it covers the nest and hole up so no other wasp or predator can find it. Then later the eggs hatch and the wasp larve/caterpillars will eat this food source so they can grow and then crawl out of the hole and turn into wasps. Wow!!! By the way, this really big lime green caterpillar/larvae is of a Speckled Green Fruitworm Moth-(Orthosia hibisci). A close up pic of it is here and also is a pic of what the worm/caterpillar/larvae would have turned into had it lived and not been turned into foot for other types of larvae. Wow!!! Also the video shown in prior post shows the wasp furiously trying to cover up and fill in the hole before I mess with it again.